Gann’s Law of Vibration generates a significant number of time-based trading theories and ideas. In fact, some of the biggest trend changes occur at the beginning/end of that cycle. And large number of cryptocurrencies have their particular time cycles end/begin within the same time period. Gann’s Law of Vibration is a concept that seems to have many Gann based traders at odds with the meaning of what, in particular, the Law of Vibration cycle is. I’ve spent considerable time reading old and new literature concerning what the exact purpose and application of Gann’s Law of Vibration is. Now, I may completely wrong here, but I took from all the sources I have that the Law of Vibration is a time cycle, specifically a 192-day cycle. That is a discovery that is shared by other Gann traders. There also seems to be some confusion as to the application of that cycle – start each cycle over on the 192nd day or start the day after that 192nd day. I have applied both cycles to my charts and have found they both work – with one generating more confluence to price swings than the other. Regardless, the 192-day cycle is a powerful one and when we end/begin a new cycle we often see major and important changes in the trend of any chart. We have some important dates to look out for in the future for the following cryptocurrency pairs. The list above is by no means a complete list of the many and varied cryptocurrency pairs that are experiencing the beginning and the end of a new 192-day cycle. 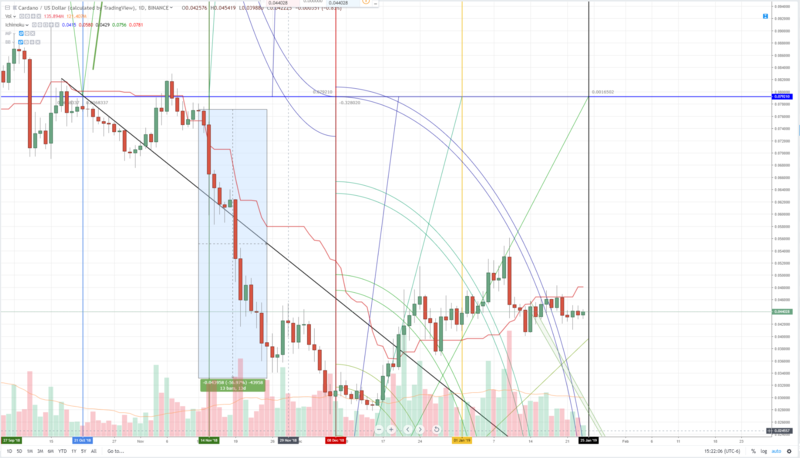 Bitcoin, Ethereum, Litecoin, and EOS, for example, have all already begun their new cycles in mid-December. What is particularly interesting is the correlation between some altcoins and their BTC pairs versus their US Dollar pairs. While a great many USD paired cryptocurrencies will have a new 192-day cycle in late January to early February, their BTC counterparts are experiencing the mid-point of those moves (96-days). It is unknown what kind of impact this will have on the price action. Another day goes by with very little action in the broader cryptocurrency market. With the exception of WAVES, NANO and some muted moves with Litecoin, the broader market remains relatively flat. Bitcoin looks primed to create a second inside bar on the daily chart, which means that consolidation is pretty extreme. This is also the third consecutive day that price has wicked above the daily conversion line, indicated continued strong selling pressure against even the weakest and fastest average in the Ichimoku system – the Tenken-sen. However, we are not observing any strong selloff even with price being in close proximity to the top of the cloud. The easiest time that I can see Bitcoin making a move where both price and the Chikou Span are above the cloud wouldn’t be until March 6th, 2019 – and that would be assuming we see price action consolidate at this level until that date. Otherwise, the cloud above us is massive and that represents strength – meaning it’s extremely difficult for price to break above that zone.